Hundreds of firefighters representing departments on both sides of the Mississippi River and as far away as the Chicago area joined mourners at funeral services for Godfrey Fire Capt. Jake Ringering Tuesday at St. Mary’s Catholic Church. Henry Street and some surrounding streets were barricaded off at about 8 a.m. as mourners arrived, and more than 180 emergency vehicles ranging from cars to aerial ladder trucks were lined up for the processional. Ringering was killed March 5 when a portion of brick structure collapsed at a Bethalto house fire. The Godfrey Fire Protection District was one of several departments providing mutual aid at the blaze, which is still under investigation. Firefighter Luke Warner, who was also injured and underwent surgery in St. Louis for two broken legs, was among those attending visitation Monday and the service Tuesday. For the firefighters attending the funeral from many different departments, it is about tradition and brotherhood. The funeral mass began at about 10 a.m., and people started gathering at the intersection of Piasa and Broadway by about 12:30 p.m. A number of people were carrying flags. The procession, which included more than 180 emergency vehicles ranging from police cars to aerial ladders, left the church at about 12:30 with Ringering’s casket on top Godfrey Pumper No. 1410, followed by other Godfrey Fire apparatus. They were followed by the East Alton and then the Alton Fire Department. The procession made its way to Valhalla Memorial Garden for graveside services. Funeral services for Godfrey Fire Capt. 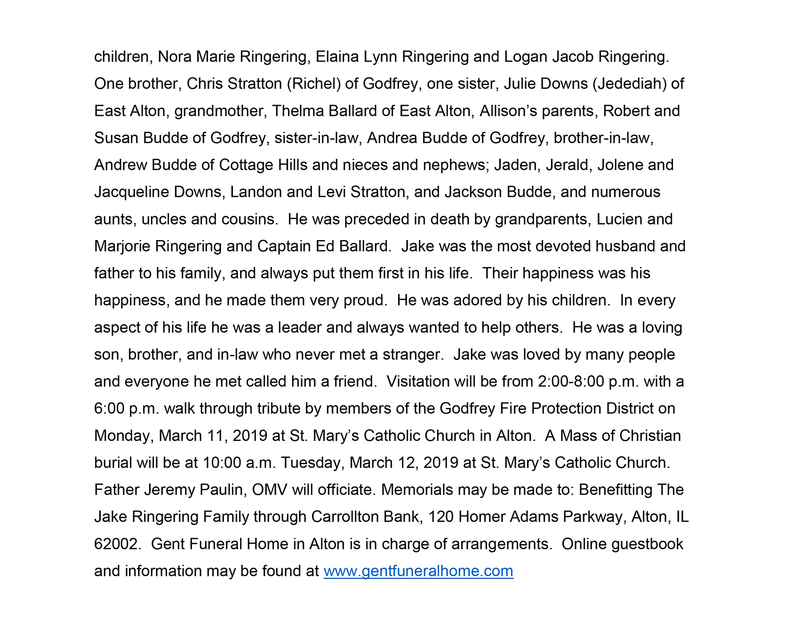 Jake Ringering have been set for Tuesday at St. Mary’s Catholic Church in Alton, and numerous fundraisers have been set for his family. Ringering, 37, was killed Tuesday when he was struck by part of a brick wall while he was fighting a residential fire on Culp Lane. GFPD Firefighter Luke Warner was seriously injured, and underwent surgery on Wednesday. The investigation into the blaze at 4604 Culp Lane, Bethalto, is ongoing and is expected to continue at the site through next week. Visitation will be from 2-8 p.m. Monday, March 11, at St. Mary’s Catholic Church in Alton, with a 6 p.m. walk-through by members of the Godfrey Fire Protection District. Funeral services will be 10 a.m. Tuesday, March 12 at the church, with the Rev. Jeremy Paulin officiating. Memorials may be made to: Benefiting the Jake Ringering Family, through Carrolton Bank, 120 Homer Adams Parkway, Alton, Illinois, 62002. A number of other fundraisers have been announced, including 3-6 p.m. Friday at the Godfrey McDonald’s; 11 a.m. Monday, March 11 at Bakers & Hale; and 10 a.m. to 10 p.m. Wednesday, March 13 at Roma’s Pizza in Bethalto. Donations are also being accepted at the Alton, Bethalto, East Alton, Jerseyville, and Wood River police departments. In addition, a fund has been set up for Warner, with donations to be sent to “Benefiting the Luke Warner Family” at the Carrolton Bank. For a more complete list visit the Godfrey Firefighters IAFF Local 1692 Facebook page. Godfrey Fire Department Capt. 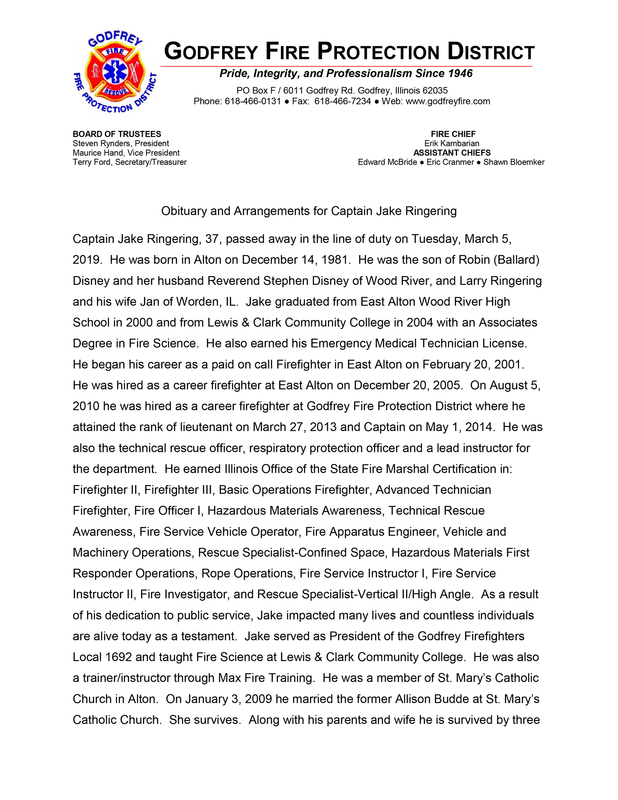 Jake Ringering was killed Tuesday after a brick structure collapsed on him while he and others fought a fire in the 4000 block of Culp Lane in Bethalto. Another firefighter with the department, Luke Warner, suffered injuries and was transferred from the scene by helicopter. He is in stable condition, according to a press release sent Tuesday night by Alton Fire Chief Bernie Sebold. A release from the Madison County Sheriff’s Office says two other firefighters were injured and have since been released from the hospital. Their names were not released. The first crews were called around 4:16 p.m. to the home for a fully-involved house. A family living there had escaped, but reported several pets in cages remained in the home. Firefighters from multiple departments worked the scene for nearly an hour when there was the report of multiple injuries to firefighters after part of the home collapsed. An official cause of the fire was not immediately given by fire officials. It appeared to originate in an area of a garage, from where injured firefighters were seen being taken on stretchers. Firefighters from Cottage Hills, Bethalto, Brighton, and Godfrey responded to aid the Fosterburg Fire Protection District, which was first on the scene. Alton Memorial Ambulance, Lifestar Ambulance, Survival Flight, and the Madison County Sheriff’s Department were also on the scene. Late Tuesday night, fire and rescue agencies from across the metro area formed a procession that carried the body of Capt. Ringering from Alton Memorial Hospital past Godfrey Fire Station 1, where personnel stood in salute outside. The procession then continued past the East Alton Fire Station, and on to a Madison County facility. During the procession, the Edwardsville Fire Department manned Alton stations, and Alton personnel covered Godfrey calls.